NASBP has compiled materials to help small and emerging contractors familiarize themselves with surety industry topics, terms, and practices. See the Articles, Forms, and Presentations below. NASBP has compiled the following articles to help small and emerging contractors familiarize themselves with surety industry topics, terms, and practices. This NASBP publication addresses questions frequently asked by public and private owners about surety bonds and the surety bonding process. It is intended to try to eliminate the misunderstandings and misconceptions that owners often have about the surety product and the bonding process. This NASBP publication addresses questions frequently asked by small and emerging contractors seeking to obtain surety credit and to grow their businesses. Surety professionals will find that these simple, straight-forward answers to complex questions can start a dialogue with clients about the bonding process. This is a two-page, easy-to-understand document that discusses the differences between subcontractor bonds and subcontractor default insurance. The first page provides an overall explanation, and the second page contains a comparison chart. This is a two-page, easy-to-understand document that discusses the differences between contract bonds and a project completion services agreement. The paper explains that the proposed services in a project completion services agreement are not a proper substitute for the protections of performance and payment bonds. Joint Check Agreements are an effective tool for sureties and contractors (and owners and subcontractors and suppliers) to ensure that downstream parties are paid, minimizing the possibility of liens against the property and of payment bond claims. All parties to a joint check agreement should be familiar with the “joint check rule,” which has been adopted in a number of jurisdictions. This article, first published in NASBP’s magazine, Surety Bond Quarterly, explains how and why contractor, subcontractor, and supplier claimants must strictly comply with bond and lien notice requirements or risk losing their bond and lien rights. Funds administration is a method that sureties use to minimize the possibility of a claim against a payment bond. Funds administration can benefit contractors as well by enhancing a contractor’s ability to obtain surety credit and learning how to manage cash flow and project funds. This document contains the websites of Disadvantaged Business Enterprise (DBE) Certifying Agencies throughout the country, organized by state and department. Users can utilize this information to quickly access information on certifications in their states and cities. This article, by Todd Schaap of Shorewest Surety Services, Inc., in Franksville, WI, describes how a bond producer can assist a contractor with financial expertise, subcontractor risk management, and relationship building. This 7-page document, developed by the Associated General Contractors of America, with input from NASBP and SFAA, provides owners, contractors, subcontractors, and other construction industry stakeholders with a basic understanding of the contract surety claims process. This is an updated version of a document developed by AGC in 2004. Find information on types of contract surety bonds, what obligees should expect in a performance default situation, what a claimant should expect in a payment bond claims situation, and many other topics. When selecting a surety, a small and emerging contractor should take steps to verify the legitimacy of the surety and to ensure that the surety authorized the bond. This article describes ways to help assure that a surety and the surety’s bonds are genuine and provide the promised protection. 13. Always Verify Your Bond! This one-page summary of the article above describes the two-step process to help contractors verify the authenticity of surety bonds. Before signing a surety bond, a contractor should understand the terms of its obligations, responsibilities, and risks stated in the bond. This article describes the anatomy of a bond and problematic language. The surety company will require that the contractor execute a general agreement of indemnity (GIA) before it will issue bonds on behalf of the contractor. GIAs can have a powerful impact on the contractor and his/her construction business. Read this article and learn some of the terms and conditions typically found in GIAs. A contractor can benefit from these valuable tips about qualifying and selecting two important members of its advisory team: the bond producer and the surety company. Choosing the right bond producer and surety helps assure the construction company’s growth and development with regard to surety credit and financial documentation. To protect their business, contractors should have an awareness and knowledge of these basic facets of construction risk. This article provides nine checklists to help contractors identify, assess, and manage risks on a specific project. This article describes the four primary dispute resolution options in the construction industry i.e. litigation and the three key alternative dispute resolution methods. NASBP has compiled the following forms to help small and emerging contractors familiarize themselves with surety industry topics, terms, and practices. This simple form acquaints contractors with the information they may be asked to provide when they initiate a relationship with a surety bond producer. In fact, a NASBP bond producer may provide this form to the contractor during an intake interview. This convenient worksheet helps a contractor assemble the full contact information of professional service providers who are critical to the success of the contractor’s construction business. NASBP has compiled the following PowerPoint presentations to help small and emerging contractors familiarize themselves with surety industry topics, terms, and practices. 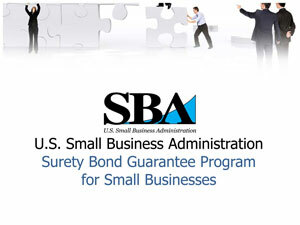 This PowerPoint presentation describes the basics of surety bonds and how a construction company can obtain a bond by participating in the U.S. SBA Surety Bond Guarantee Program. 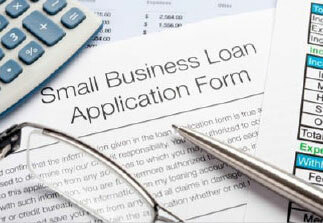 The presentation addresses the bonding process and the characteristics of firms that qualify to participate in the SBA Program, the SBA Program’s bond application process including the QuickApp system, and the SBA fees i.e. the contractor’s bond costs that can be paid electronically through the Pay.Gov system. It concludes with information about how to locate an SBA bond producer and the SBA Program’s primary contacts. This PowerPoint presentation describes how professional surety bond producers specialize in providing surety bonds to contractors, subcontractors, and other construction project participants. The presentation describes the role of the producer, keys to a successful relationship with a producer, questions to ask when selecting a producer, and resources where you can find a producer. 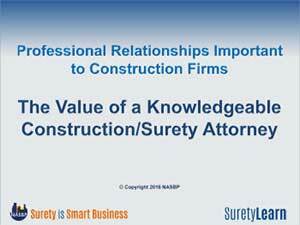 This PowerPoint presentation describes how knowledgeable construction/surety attorneys are invaluable legal advisors and business advisors to small and emerging contractors. This presentation describes the areas of law that these attorneys should know, their role in helping small and emerging contractors, the keys to a successful relationship with them, questions to ask when selecting one, and resources where you can find construction/surety attorneys. This PowerPoint presentation describes how knowledgeable bankers can provide invaluable business and financial advice to small and emerging contractors. This presentation describes small business bankers for construction firms, their education and experience, their role as a small business banker, keys to a successful relationship with a banker, questions to ask when selecting one, resources where you can find a small business banker in your area, and tips to remember. 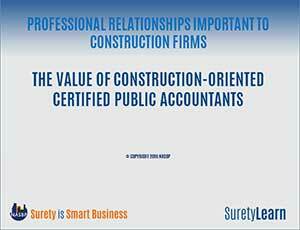 This PowerPoint presentation describes how knowledgeable construction-oriented certified public accountants (CPAs) are critical to the financial management of a small and emerging contractor’s business. This presentation describes CPAs, the role of a construction-oriented CPA, keys to a successful a relationship with construction-oriented CPA, questions to ask when selecting one, and resources where you can find a construction-oriented CPA in your area. 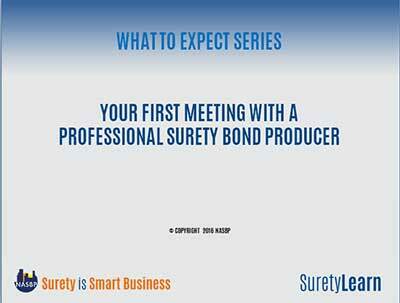 This presentation provides the steps to find a professional surety bond producer and a description of what you can expect in the first meeting. 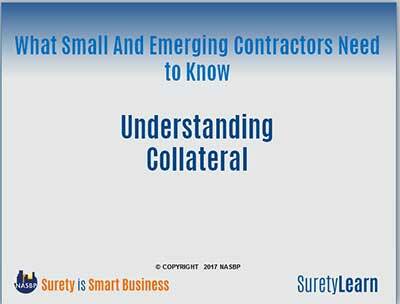 This slide presentation explains why sureties sometimes require collateral from a contractor, how collateral benefits small and emerging contractors, how its centralization process works, and the forms of collateral accepted by sureties (cash, ILOC, and real estate) as well as those forms not accepted by sureties. 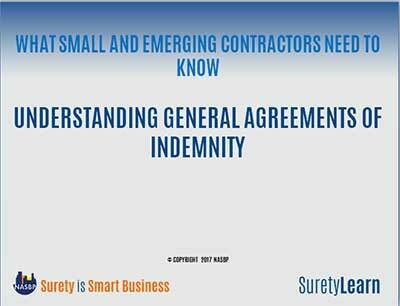 This PowerPoint presentation provides an overview of general agreements of indemnity (GIAs), an explanation why sureties require contractors to sign GIAs, and a list of key points to remember about GIAs. Also, the presentation describes eight key provisions of the GIA: indemnification, right to enforce the GIA, right to settle, prima facie evidence, collateral, assignment, right to examine books and records, and duty to cooperate. 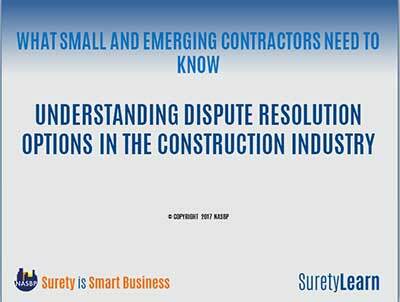 This PowerPoint presentation provides an overview of dispute resolution in the construction industry, tips about selecting and negotiating dispute resolution methods, a description of the four primary dispute resolution options in the construction industry—litigation and the three key alternative dispute resolution methods developed to address criticisms of litigation, and key points to consider about dispute resolution options. 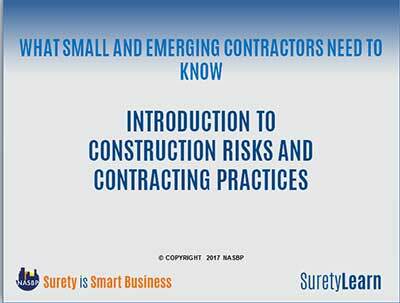 This PowerPoint presentation provides a list of the risks and exposures that contractors should identify, an explanation why understanding the construction contract is critical, a description of the typical components of a construction contract, a list of provisions often part of the general conditions, a description of contractual risks, a list of the industry’s standard form contracts, a list of cautions about working with standard form contracts, and a resource where you can find checklists to help identify, assess, and manage risks on a specific project. 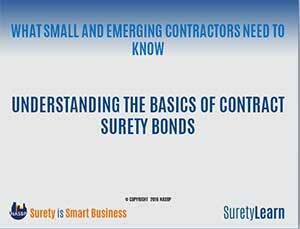 This PowerPoint presentation describes how surety bonds are unlike traditional insurance policies; defines the general agreement of indemnity and the three main types of contract surety bonds: bid bonds, performance bonds, and payment bonds; explains the surety prequalification process of a contractor or subcontractor; lists who requires contract bonds for projects; and explains the importance of professional service providers to contractors seeking bonds. This PowerPoint presentation describes the funds administration method that sureties use to offset the possibility of a claim against a payment bond. 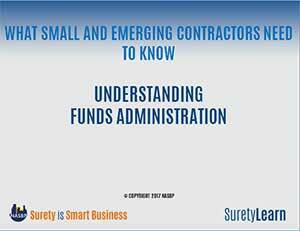 This PowerPoint describes the steps involved in the funds administration process and the ways funds administration benefits small and emerging contractors. 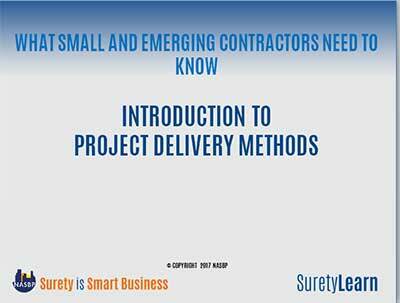 This PowerPoint presentation describes the four most common project delivery methods: Design-Bid-Build (DBB), Design-Build (D-B), Construction Management at-Risk (CMAR), and Integrated Project Delivery (IPD). While there is no one “best” delivery method, there are advantages and disadvantages in using each method as described in this presentation. 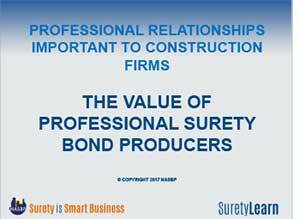 An Information Center by the National Association of Surety Bond Producers, Inc.